In 1492, Columbus sailed the ocean blue. Perhaps he initiated genocide, too. But should that matter in 2018? It should, and it does. 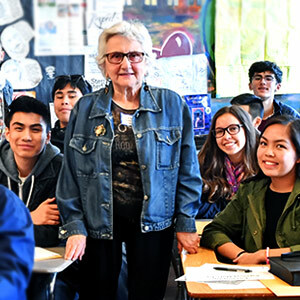 Last spring, one of the Holocaust Center’s Manovill Fellows taught her peers at Encinal High School in Alameda about indigenous genocide in California. When looking over her lesson plan, I couldn’t help but be reminded of my own early education. I was taught almost nothing about Native American history or culture, but I remember learning innumerable facts about the Niña, the Pinta, and the Santa Maria. Why are children taught to revere Christopher Columbus as a hero? The legacies of colonialism and its connection to genocide are complicated. Over the past 75 years, the global community has developed processes for addressing genocide as it unfolds, including economic sanctions, military interventions, and prosecution of perpetrators. The same cannot be said for crimes related to colonialism. Most former colonial powers do not have a great record when it comes to addressing colonial atrocities; however, recent decisions by the municipal government of San Francisco provide a glimmer of hope that our local narratives on colonialism are changing. The administration of San Francisco has recently taken two important steps towards dismantling the overlooked legacy of colonialism. First, in a 10-1 vote by the San Francisco Board of Supervisors, the city approved a measure to commemorate Indigenous Peoples’ Day instead of Columbus Day in all municipal institutions. The switch is not unprecedented. Beginning with Berkeley, California in 1992, cities spanning the country have ousted Columbus in favor of celebrating Native American heritage and culture. The second step occurred just last month. After years of lobbying by local Native American activists and their allies, San Francisco finally removed the “Early Days” sculpture from a prominent display near City Hall. The bronze statue depicted a missionary and a Spanish settler looming over a Native American man. Many in the community have long argued that the statue glorified colonialism and the subjugation of the indigenous people of California. By taking it down, San Francisco has taken a small step toward changing our society’s racist and celebratory colonial narrative. 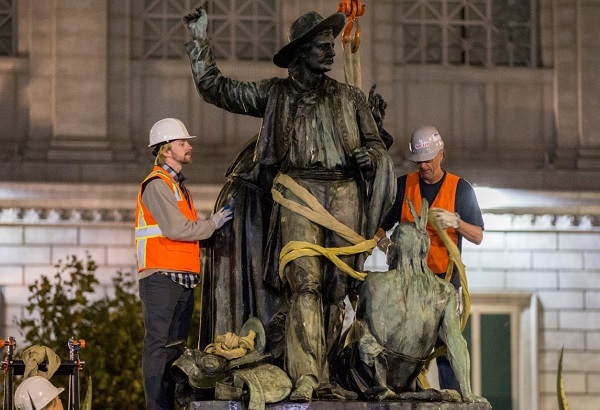 Workers removing the Early Days statue on the morning of Sept. 14, 2018. Photo courtesy of Jessica Christian via Twitter. The starting point for ending systems of oppression is to recognize and name that oppression. By removing a statue with a racist message and choosing to honor Native Americans rather than Christopher Columbus – a 15th century explorer who more closely resembles a génocidaire than a hero – San Francisco has publicly recognized the harm done to indigenous peoples of the Americas. This is an important first step. The wounds of colonization, though, cut very deep: Survivors of colonial violence were forced out of their homes, off of their land, and onto reservations. Their children were often taken from them and sent to residential schools where they were forced to speak a different language, practice a different religion, and reject their heritage. The removal of a statue in downtown San Francisco, while a symbolic victory, does not right the wrongs of our forefathers; however, it does signal a willingness to engage in a discussion about the more negative aspects of our national past. Colonial violence has had long-lasting effects on indigenous communities that continues into the present. A Pew Research study from 2012 found that one in four Native Americans lives in poverty, and on some reservations the poverty rate is higher than 40 percent. Additionally, native communities are less likely to graduate high school and more likely to be victims of police violence than any other community in the US. Tell it like it is. Colonialism in all forms is destructive at its best, genocidal at its worst. You and I may not have committed the crimes, but we are all responsible for perpetuating the damage. We must rid ourselves of historical amnesia through education. We must also learn about discrimination in the present. Disrupt racist narratives at the local, national, and global level. This is, of course, much easier said than done, but we must be willing to do this work. San Francisco’s recent decisions won’t end centuries-old systems of oppression. In all actuality, most people probably won’t even notice the missing statue or the holiday change. But these small actions matter. Not only do they raise awareness, but they can also have a ripple effect. Today San Francisco, tomorrow the world. Calling out Columbus is not justice, but it’s something. Germany, for example, engaged in a long and difficult process of coming to terms with the crimes of National Socialism, but has done far less to make amends for its genocide of the Herero. Churchill, Ward. A Little Matter of Genocide: Holocaust and Denial in the Americas, 1492 to the Present. San Francisco: City Lights Books, 1997. Hewitt, William L., ed. Defining the Horrific: Readings on Genocide and Holocaust in the 20th Century. Upper Saddle River, NJ: Pearson Education, 2004. Madley, Benjamin. An American Genocide: The United States and the California Indian Catastrophe, 1846-1873. New Haven, CT: Yale University Press, 2016.